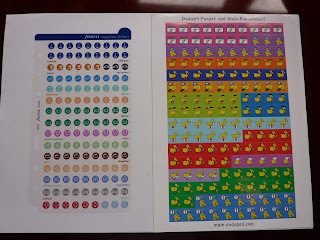 Dodo pad stickers (which I use on my Dodo Wall Pad). These are colorful and funny without being cutesy. My preschool-age son and daughter love the Dodo, and because they can't read yet the stickers help them see what's going on in our week. 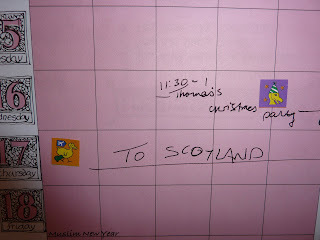 For example, in the week shown we had a kids' party, and were traveling to Scotland (which they were very excited about). Filofax stickers, blogged about by both Steve and myself (which I use in my Minister and also used in my Moleskine planner) are subtle icons on round stickers that look good in any planner. They help events stand out when I am flipping through my planner. Philofaxy readers love these stickers, and I think I can safely say that the Filofax stickers have been welcomed with open arms by the Filofaxing community. 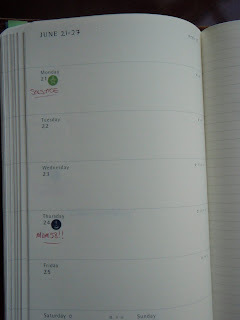 Do you use stickers in your planner to indicate important events? If so, what kind of stickers do you like to use? I don't normally use stickers, although the last few months, I did use the stickers in the back of my moleskine to mark parties, meals out and pay day, although that was more because I was bored during my commute. Although the idea of using bright stickers to jazz up a planner is appealing. Love your stickers, very cute. I looked at a pack of the Filofax stickers in a local store the other day, and didn't buy them. I thought the printing on them looked blurry and I couldn't make out the icons. But looking at the closeup of the stickers in your Moleskine, I see that's not the case. Hmmm....maybe I'll jump on the sticker bandwagon! @Nan: I had the impression of these stickers being "blurry", too - but then found out it's just because there are 2 sheets of stickers in a pack, and the second one is shining through. You're right! We philofaxers absolutely love them!! I've been using mine aver since i got them, almost a year ago. They are not too big to take up space, and not too small that you will oversee them.